During today’s Gonabadi Dervishes protest, the protesting women were attacked and beaten with batons by security forces, resulting in a number of injuries. The injured women were arrested among the other protesters arrested today and were taken to Evin prison. Gonabadi Dervishes news site, Majzooban Noor reports 250 people were arrested during the last two days of the Dervishes protest. The site has published the names of 173 people arrested who have been identified so far. Among those taken to Evin prison with their mothers, were 3 children ages 1.5 to 11 years old. – Parisa Islami, sister of incarcerated Dervishs’ lawyer Amir Islami. She suffered broken teeth as a result of being hit by the security guards. – Attorney, Mrs. Allaei. she suffered skull fracture and severe facial bleeding. – Manzar Malek suffered a broken hand. – Nazila Nouri, a physician, and Sepideh Moradi daughter of incarcerated Gonabadi Dervish member Hamid Reza Moradi, both suffered severe bleeding from their head and face. A year after their arrest, journalist brothers, Masoud and Khosro Kurdpour have been sentenced to imprisonment by the Appeals Court. Khosro Kurdpour was arrested on March 7, 2013 in Mahabad, and two days later his brother Masoud was arrested after going to the Intelligence Ministry’s office in Mahabad to do a follow up on his brother’s case. After 8 months of imprisonment, Masoud and Khosro Kurdpour were put on trial by the Revolutionary Court in Mahabad, presided by Judge Javad Kiya, and after 3 trial sessions they were sentenced to a total of 9.5 years imprisonment. Masoud Kurdpour was sentenced to a total of three and a half years. 3 years on the charge of “assembly and collusion with intend to act against the national security”, plus six months on the charge of “propaganda against the regime”. Khosro Kurdpour was sentenced to 5 years imprisonment on the charge of “involvement in assembling groups for the purpose of protests”, and one year imprisonment on the charge of “propaganda against the regime” and 2 years forced exile living in the city of Kerman. Osman Mozayen, one of Kurdpour brothers’ lawyers, wrote in a post on his Facebook, “Khosro Kurdpour’s sentence has been reduced to 5 years imprisonment, to be served in Tabriz prison, and Masoud Kurdpour’s sentenced reduced to 3 years imprisonment”. He also said that despite numerous requests by the Kurdpour brothers for a furlough, their request has been rejected each time by the court. According to Shargh newspaper, the Supreme Court has upheld the retribution sentence of a man identified as Jamshid for having caused a woman to lose her eyesight by throwing acid on her. The Supreme Court sentenced Jamshid to gouging of an eye, cutting off his nose and his right ear lope. Shirin, the woman who brought the retribution (Ghesas) suit against Jamshid, told the court that she and Jamshid were dating, but after a while she realized she did not like his behavior and tried to break the relationship. This was when Jamshid started to physically abuse and beat her. Later, Jamshid was arrested and jailed for committing a different crime. After Jamshid went to prison, she met another man and they were planning to get married. Last year ,after Jamshid was released from prison, he contacted her and requested that she meet him for one last time. During this visit Jamshid threw acid on Shirin’s face which caused disfiguration and blindness. Jamshid told the court that he did not intend for her to lose her eyesight, and only did this to scare her, because Shirin betrayed him and was seeing another man. After Jamshid appealed the lower court’s ruling, the case was sent to Branch 31 of the Supreme Court. That Court upheld the verdict as issued by lower court. Two prisoners were hanged in Rasht (N.Iran) on charges of “Unlawful Acts Against Sharia Law”. According to the Central News Agency, Director of Public Relations of the Judiciary of Gilan province announced two men, ages 28 and 30, were hanged in Rasht’s central prison today, on charges of unlawful acts against Sharia Law, which in legal terms covers a variety of charges. In the Islamic Republic’s Penal Code, “Acts Against Sharia Law” is a general term used for a number of acts that are considered unlawful according to the Sharia Law. And other unlawful acts that are encompassed by the general terms “Unlawful Acts Against Sharia Law”. The specific charges of the 2 men hanged in Rasht on charges of unlawful acts against Sharia Law are not clear. Expelled Qazvin International University student activist, Maryam Shafipour has been sentenced to seven years imprisonment. Branch 15 of the Revolutionary Court in Tehran has sentenced Marymam Shafipour to seven years imprisonment on charges of “assembly and collusion with intent to act against the national security”, and “spreading propaganda against the regime”. This banned from education student has been incarcerated at Evin prison since August 27, 2013. She was kept in solitary confinement for more than two months before she was moved to Ward 350. She was deprived of seeing her lawyer during her incarceration in solitary confinement. 2- One year imprisonment on the charge of membership in the Right to Education Council. 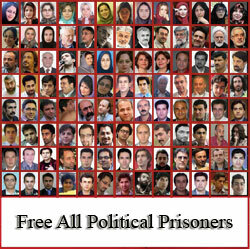 3- One year imprisonment on the charge of spreading propaganda against the regime. Maryam Shafipour is the first student activist arrested after the election of Hassan Rouhani as president of Iran. Maryam Shafipour was a Mehdi Karoubi campaign activist in the 2009 presidential election. Previously it was reported by her family that she was beaten by her male interrogators during interrogation sessions for refusing to cooperate with them in giving a false confession.